(0 Customer Reviews) | Write Review 6 issues per year Delivery Magazine is uniquely positioned as the only publication in Australia providing an in-depth focus on the entire light commercial vehicle market. This high quality, bi-monthly printed publication is distributed through newsagencies in Australia and New Zealand. 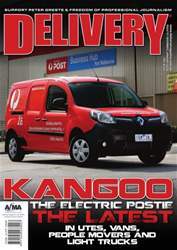 Delivery Magazine readers own or operate vans, utes, people movers and light trucks. From the tradie with one van or ute, to the national fleet operator, they want to keep up to date with the latest technology affecting their industry. They want to know which vehicle to choose, how best to finance the purchase, what accessories will make the vehicle more effective and how resale value will affect their bottom line. Delivery Magazine is packed with editorial evaluations of the latest vehicles and regular features explain the latest developments in finance, leasing and maintenance. With its specification chart analysis of all vans, utes and chassis cabs it provides the only comprehensive reference point for the business segment. which vehicle to choose, how best to finance the purchase, what accessories will make the vehicle more effective and how resale value will affect their bottom line. For the December issue the Delivery team headed over to Germany to evaluate every European manufacturer plus all the accessory suppliers, conversion specialists, manufacturers of racking and storage systems and trailer bodybuilders on display at the IAA Show in Hanover. We visit the Mercedes-Benz Sprinter factory, head to Spain to gain the first driving impressions of the new Vito and drive a very rapid 2000 kms from Germany into France in a new V-Class people mover. Back home in Australia we bring you Delivery’s take on the latest Holden Colorado, Hyundai’s next move into larger vans and a first drive of the all-electric Renault Kangoo ZE. Clean energy is in focus as we look at what Mitsubishi Fuso can offer with its electric drive Canter. Finally, we take a close look at the benefits of driver training and how we as a nation can improve safety on our roads by upskilling our drivers, both young and old. 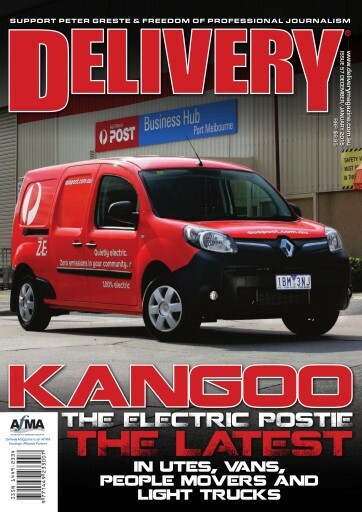 Delivery Magazine is uniquely positioned as the only publication in Australia providing an in-depth focus on the entire light commercial vehicle market. This high quality, bi-monthly printed publication is distributed through newsagencies in Australia and New Zealand. You'll receive 6 issues during a 1 year Delivery Magazine magazine subscription. You'll receive 6 issues during a 1 year Delivery Magazine magazine print subscription.